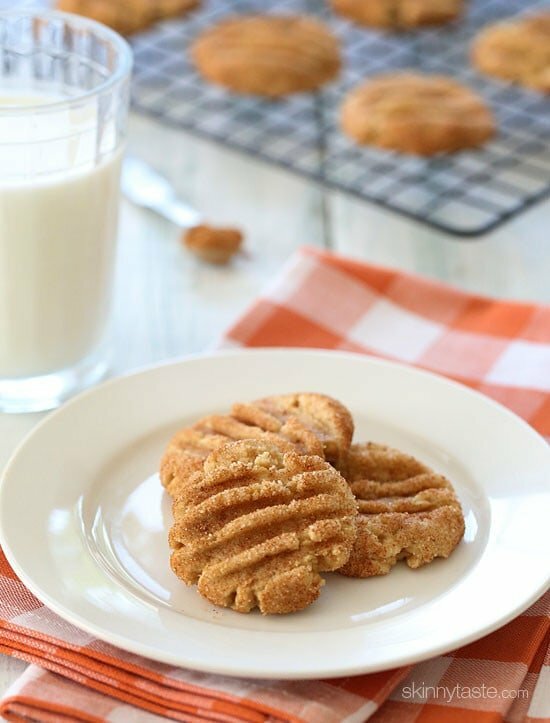 These Skinny Pumpkin Spiced Snickerdoodles cookies should really come with a warning label, because they are so good and hard to stop at just one! A snickerdoodle is a type of sugar cookie made with cream of tartar and rolled in cinnamon sugar. This pumpkin spice version was inspired by my Skinny Snickerdoodles. I wanted to see what would happen if I coated them with pumpkin spice instead – pumpkin spice heaven! More of my favorite pumpkin spiced treats are Skinny Pumpkin Pie, Pumpkin Spice No-Bake Cheesecake, and Pumpkin Butterscotch Bars. They are lighter than traditional Snickerdoodles, made with white whole wheat flour, but they taste every bit as sinful. I notices some people commented on the original skickerdoodle recipe that the dough was too dry, and yes, the dough will be dry. I’ve made them several times with success; using wet hands to form them into balls is a must and will help moisten the dough. Next time I make these, I may add a little more pumpkin spice to the dough to make them extra pumpkin-licious! Preheat oven to 375°F. Line two baking sheets with Silpat mats and spray with cooking spray. 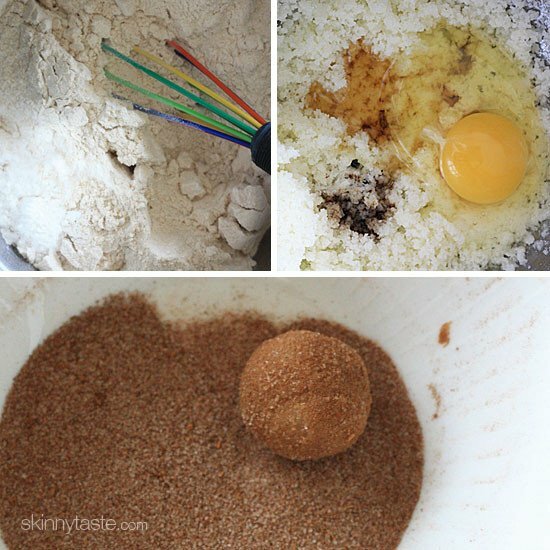 In a medium bowl, combine 3 tbsp sugar with pumpkin pie spice, stirring with a whisk to combine. With moist hands, shape dough into 42 (1-inch) balls. Roll balls in sugar/pumpkin pie spice mixture. Place balls 2 inches apart onto baking sheets and slightly flatten with a fork. Bake 375°F for 5-7 minutes (cookies will be slightly soft). Cool on baking sheets for 2 minutes. Remove from pans; cool completely on wire racks. Enjoy! *There was a little extra sugar leftover, so I deducted from the n.i.. I used maple syrup instead of the sugar, so I dropped the temperature down to 350F. I also ran out of pumpkin pie spice so I had to make some from scratch. The fresh ground cloves (I only had whole cloves, so I had to grind some) were amazing with this. Thank you! I swapped honey for agave and pure maple syrup for vanilla (as I was out and had everything else) and used regular I bleached flour and my kids are so happy with them! Delicious and fun cookies to involve my 4 year old in, as he enjoyed rolling them in the sugar/spice. Everyone loves them and they were quite easy! Like some of the mother commenters, my dough turned out too dry. I added 2-3 tablespoons of pumpkin purée and they turned out perfectly. Agree with other posters that I have no idea how this recipe came out to 42 cookies – I made tiny mini-cookies and I came out at 38. My dough wasn’t crumbly and I didn’t have a problem putting the cookies together. They came out looking very nice, however they can’t hold a candle to my regular cookie dough recipe. There is something strange about the taste – I think it might be a combination of the type of flour and not enough butter. I’d rather spend a few extra calories and make mini versions of a regular snicker-doodle recipe. 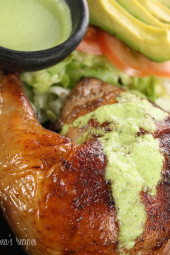 Would mashed avocado work in place of the butter in this recipe? Sigh…. These took forever to roll with the crumbly dough and weren't great. They were definitely missing some pumpkin spice – I would add to the dough (if I were to make these again, which I definitely will not). The only warning label they need is for how frustrating they are to make and how long it takes. After reading some comments I decided to add an extra egg and an extra T of butter (well, also because I had 5 T left in a stick I was using). I also used stone ground whole wheat flour because that's what I had on hand. The dough was definitely a little dry, but it worked and the cookies taste great! Also, I needed closer to 10 min for baking, but my cookies were bigger and some were in Pyrex. I used butter Crisco…and it was crumbly, but I don't think that was the issue. Read through the comments, and since I had pumpkin puree on hand, I added 1/3 cup of pumpkin to the honey/vanilla/egg round. They turned out perfect with that addition!! I just made a batch of the Pumpkin Spice Snickerdoodles. They came out delish not as pretty as yours but that's ok (lol) . I had one problem my batter was a little too crumbly I really had to put some work in to form the dough into balls. I wonder if I left the dough in the fridge a little too long. 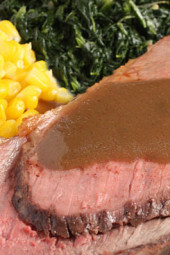 I also used Crisco Butter Flavored Stick instead of actual butter. I will make these again & again. Thanks for sharing such a delicious cookie! Just made these, they're tasty! I'd be curious to try adding a bit of pureed pumpkin (or just some pumpkin spice) to the dough itself for a little more pumpkiny goodness! Yum! I added 1/4 c canned pumpkin puree to the dough and these turned out great. My boyfriend an I loooove these cookies! 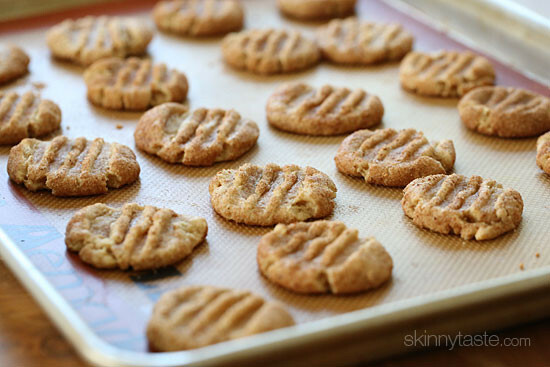 I used King Arthers whole wheat flour and they turned out great! These cookies came out perfect and were a huge hit! While trying to soften margarine in the microwave, I made the mistake of melting most of it. Perhaps this was the reason my dough came out moist and not crumbly like others had mentioned. I made 37 cookies, and ended up cooking them for about 9 minutes. They came out chewy and no one suspected they were healthy! One more comment, I made these with King Arthur's regular whole wheat flour (not white). They tasted great! My granddaughter is allergic to wheat flour. Can it be substituted with white Flour? I added an ounce of canned pumpkin and the dough was much easier to work with. Cookies are delicious! I too had an issue with my batter being VERY crumbly. I used King Arthur white whole wheat flour like the recipe states, and honey. I use wet hands to form them into balls but I really had to fight it to make them hold together. I haven't put them in the oven yet, but I'm worried they are going to be hard and dense instead of light and fluffy like a snickerdoodle should be (I've made regular snickerdoodles in the past with good results). Let's hope these are edible. Oh and I only got about 23 of the 1 inch balls. I don't see how in the world it would be possible to get 42 one inch balls, unless you made them super teeny tiny, way smaller than 1 inch. Made these twice. Such a hit. Heaven right out of the oven. Stay nice and soft even next day- they haven't lasted more than a day. I followed the recipe exactly. Mine are a crumbly mess. They even broke apart while baking. Haven't tried the pieces yet, but this definitely needs something to hold it together better. My hands were wet when making the balls too. What a mess! ok ladies I made these the other night, excellent and in response to the cookies sticking, glad I read that. as gina says use water on your fingers when rolling and keep dough in the frig inbetween baking if you are baking in batches. This helps a lot. made these 2 days ago. They lasted only 24hrs in my house- and that was with a lot of restraint. Delicious. Added about a teaspoon of pumpkin pie spice to batter as well. Warm out of oven is heaven. Huge hit with my 12yr old, 10yr old and 6yr old. I just made these for a meeting I have tomorrow and they are incredible! Like someone else said, I had a hard time telling if they were done or not so they're a little crunchy, but they taste wonderful! I'm just hoping that my husband and I don't eat them all before I get them to my meeting!!! Could I use oat flour to make these? Gina – could I use almond flour for this recipe? Do you think it would turn out ok? They sound lovely but I am trying to cut out as much gluten as possible from my diet….thanks! 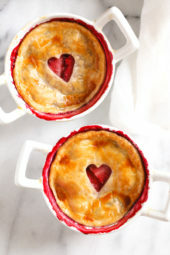 I am making these tonight for company tomorrow! Can't wait. These are AMAZING. I may need to leave the house so I don't exceed my limit of two. I now officially love you. Seriously, in my house, a common question is now, "Was this Gina's recipe?" Does anyone know how to save these on evernote? My evernote clipper doesn't seem to work on this site. These were great…I mistakenly put the pumpkin pie spice right into the dough but they turned out great…I would use a little less sugar next time! Is there a way to make these gluten free? Like just replace the whole wheat flour with almond flour? I noticed that some people said they had to get pumpkin pie spice. I make my own with 1tsp cinnamon, 1/4 tsp nutmeg, 1/4 tsp ginger, and 1/8 tsp cloves. All of these are ground spices that i usually have on hand. Thank you, Gina, for your hard work in the kitchen. I have not tried anything from skinnytaste that has not been yummy. I'm sure a lot of testing has to happen before the perfect product can be passed on to the people. I appreciate it! Was out of Vanilla and substituted Almond Extract. THESE ARE AWESOME. Thank you, Gina!!! Can't wait to make these tonight! Is it okay if I use all-purpose flour instead? Hope the turnout will still be the same. Made these last night and they turned out great! I was worried about the crumbly dough but I checked out the reviews and was glad to see others had the same problem. I think next time I need to make my hands even more wet but overall everything turned out well. The cookies aren't the most beautiful thing I've ever made but they taste absolutely delicious! OMG!!!!! These cookies were fantabulous!!! They were fantastic and fabulous all in one little cookie. They were easy to make, my seven year old son helped me. I was a little concerned when my dough came out so dry but I just kept on and they turned out perfect. I made them to big and only ended up with 26. Needless to say, there is not a single cookie left!! These look fabulous! Do you think it would be possible to substitute canned pumpkin for the eggs and butter? Someone commented above that they used pumpkin in place of butter and they worked, not sure about the eggs. I saw these and got SO excited!! what a yummy fall treat. I'm on the Atkins diet though, so I think that I can switch some ingredients to make these Atkins friendly…I am going to try this w/ Almond flour, Splenda brown sugar blend and Splenda drops and I think that might do it! There are cookies on the horizon this weekend! Thank you for posting such amazing recipes!!!! Made this yesterday and oh man are they good!! I used parchment paper sprayed with cooking spray and didn't have any problems. The batter is very dry but using wet hands really worked! I made them a little bigger than one inch so I ended up with 25 cookies. YUM! Perfect, glad they worked for you! 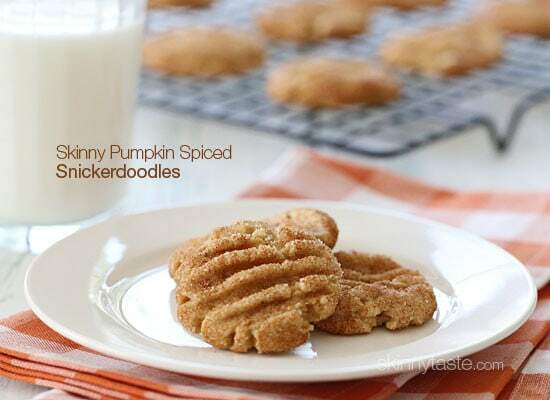 Well, I am a huge SkinnyTaste AND pumpkin AND snickerdoodle fan, so of course I had to whip these babies up ASAP! Made a batch tonight and the family went wild, proclaiming that they "never wanted any other kind of snickerdoodle cookie ever again!" I will admit that I got a little worried in the beginning about how they were going to turn out when my batter was like coarse crumbs, but you just have to trust Gina and use wet hands when rolling the batter into balls – it does come together and turn out wonderfully! I have a feeling this won't be the last time I'm making these this fall… thanks Gina for another home-run at only 50 calories! Yay! PS: I got nowhere near 48 cookies, I ended up with 18?? So glad you liked them, Yours were certainly bigger than mine! Wonderful! I did use two eggs and the batter was much less crmbly. Also you can easily use 4 tbsp cinnamon, 1 tbsp nutmeg, 1/2 tbsp ginger and 1/2 tbsp allspice to make pumpkin pie spice. Wet hands are essential. Thank you Gina!!!!!! Good to know about the pumpkin pie spice recipe because I just had to go out and buy a tiny bottle of it for $7! Maybe this tip will save some folks a couple bucks and a trip to the store at night needed to satisfy a pumpkin craving…ha! Yes, wet hands are a must! Ruh roooohhh. Boyfriend's favorite cookie? Snickerdoodle. Boyfriend being born on Halloween? Natural disposition to obsess over pumpkin and pumpkin spiced things. I just showed this recipe to him and his eyes grew wide and is demanding this to be made ASAP. These look amazing! Can't wait to try them!! I made these today, but used 1/4 Cup of fresh pumpkin pureé in place of the egg and 1/2 the butter… YUM, and even less points! 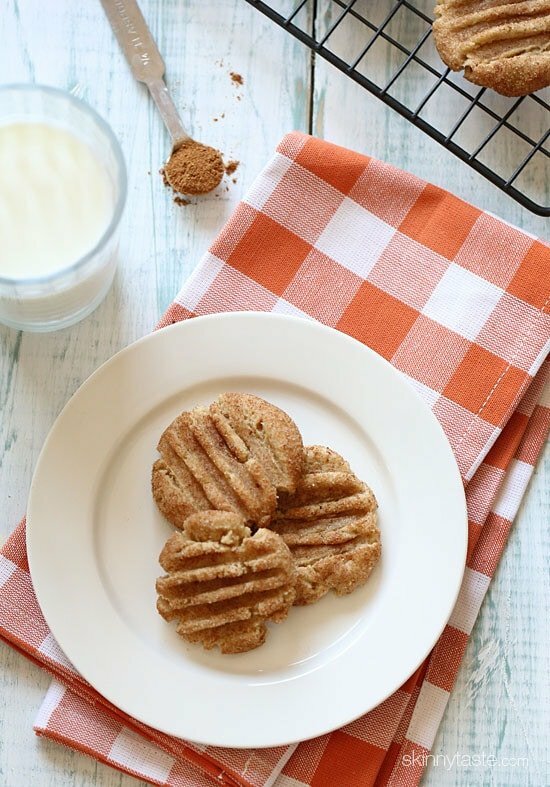 Love pumpkin spice snickerdoodles – can't wait to try this skinny version! Tis the season for all things pumpkin spice! These look sinful 🙂 in a good way of course! Just finished making these and can't stop eating them!! Thanks for the recipe!! Just made them. FABULOUS. My daughter, prior to me making them, declared she didn't like snickerdoodles. Yes. Yes she does. Thank you!! Oh my god these look delicious! I need to attempt to make these!! Yay, I am glad they worked for you!!! How would you compare white whole wheat flour to whole wheat pastry flour? I added maple syrup instead of honey/agave. Delicious! It did not make 42 (more like 38 and that was keeping them at 1 tsp). I wondered the same thing. Mine fell all to pieces. Ugh, do yourself a favor: pick a different snickerdoodle recipe & just add pumpkin pie spice. I usually LOVE all the recipes on skinnytaste, but I am fairly certain I haven't angered any God enough to do the kind of battle I had to do with this dough. I'm surprised that it didn't work for some of you, I make these all the time and see people posting this snickerdoodle recipe with success on my instagram. Perhaps adding a few drops of water with be the solution for you, I found using wet hands was enough to wet the dough and hold them together. Did you use the same pastry flour? Just trying to see if you did anything different. I had to use a generic brand whole-wheat white flour (my store only had regular white King Arthur Flour) and I had the same problem with dryness and crumbly batter. I also used honey instead of agave since they seemed interchangeable. I also had a problem telling if the cookies were baked all the way through, so they ended up over-baked and a bit crunchy. But the taste was good! My batter was sooo dry, too. I used a different whole-wheat flour. I ended up adding a good half-cup or more of water, and the dough was just a pain. I had the dryness issue, too. I plopped in about 1/4-1/3 cup pumpkin puree and that made it come together nicely, and they baked up really well and are TASTY! My cookies also turned out like cooked balls of flour. I followed the recipe exactly, and chose honey instead of agave. They were not edible. Hellllp! This may be stupid, but how do I keep my hands moist the whole time!? I tried! And then I tried to add water to the dough…and that wasn't a good plan. My cookies were dry and crumbly…so they are ugly…but delicious! But I can't bring ugly cookies to the Halloween party this weekend! Loved the pictures. And since I love spices I am sure I'd love the cookies too. So excited! I have everything I need for these! Could you add some pumpkin purée to offset the dry dough? I added about 1/3 cup of pumpkin purée and deducted the 1 tbsp of honey or agave and the dough was still light after baking. Tasty! Oooh yes, let pumpkin season begin!! These are going on my Pumpkin-dedicated Pinterest board! 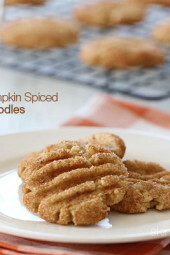 These look AWESOME.. can't wait to make them in a few weeks when the pumpkin cravings kick in! I've made a pumpkin snickerdoodle recipe that also has pumpkin puree in the dough. Would this boost the points too much? These look incredible, Gina! Such a wonderful fall treat skinny-fied. Love it! Just made a batch and mine didnt make 42 cookies…maybe I made them to big? doesn't matter they are good!!!!!!!!!!!! I'll send you a picture Gina!! 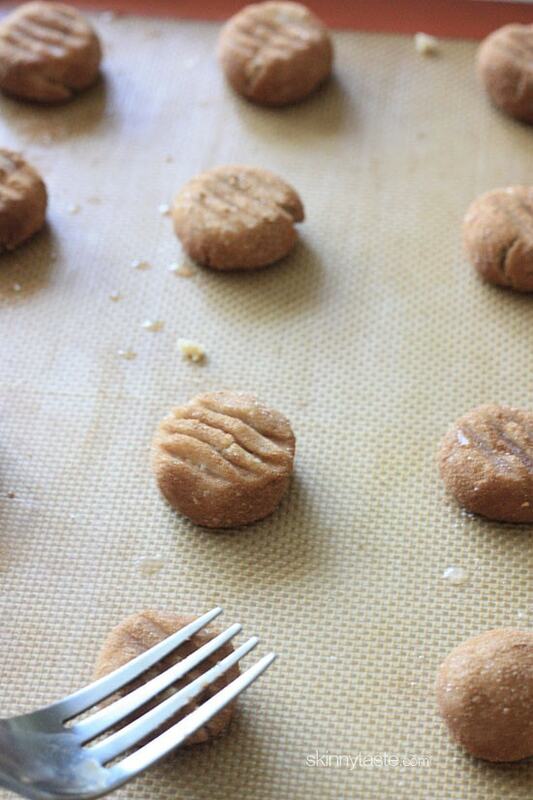 I always end up with fewer cookies, too, no matter the recipe! My recipe made 34…still amazing and super low in calories for a great treat! What could you substitute regular white sugar for? I am trying to avoid it- could you use stevia, agave, etc? and how much? Thanks so much! Mmmm… i need this with my daily cup of hot green tea! Yum!! Can you use regular whole wheat flour? whats the difference? These look absolutely amazing! I've been craving pumpkin spiced late (not sure if you have a recipe or not, I'll have to church) and these would go great with it in the morning! I'll have to get pumpkin dice as I don't have it, but will do so today! Just a quick side comment: I've just recently jumped on the blogging bandwagon (through pinterest) and I don't typically check blogs regularly except when is pinned. I'm happy to say, I have started checking yours regularly! Love your recipes! Keep them coming! LOL just checked my pantry and I do have the FLOUR (used it for a different SKINNYTASTE recipe ) and now i just need the pumpkin pie spice!!! No SILPAT MATS though – do you spray the sheet or not? Oh dear – I have every single ingredient on-hand. I will have to make this ASAP! Did you use regular sugar or a sugar substitute? Just to say there was extra sugar left at the end, so I deducted them from the n.i. Hi! What are the * for by sugar and pumpkin pie spice? Love all of your recipes… just did the Banana Split bars, but subbed in pumpkin and were awesome! I think the asterisks next to those are to set it apart; the dough itself uses 1 C of sugar, but the asterisk next to the pumpkin spice and the additional 3 TBSP is to set it apart as the sugar/spice mixture you'll roll the dough balls in. Hope that helps! Heading to the store to pick up the flour and pumpkin pie spice….its supposed to cool down a bit here in Farmingdale over the next few days and this will be a good thing to do! I know, looking forward to the cooler temps! if you don't have those SILPAT MATS what do you do to the cookie sheet?